This post is by Shifa Desai, a part-time PhD student at the University of Exeter in the UK. Shifa is doing research on self-initiated expatriate academics who have spent most of their careers working in different countries. She is also an ESL teacher, teetering on the edge of burn-out between full-time employment and part-time research. Much of PhD work is about organizing logic and reason through research. This is the domain of the Intellect. When I’m not engaged in making my research intelligible, I devote part of my day to spiritual practice and I engage that part of my mind where reason and logic are not required. While I grapple with stacks of published articles and academic literature in my field of educational research, I am struck by how akin the PhD struggle is to my spiritual journey. I have outlined seven spiritual lessons I’ve learned. I stand on the shoulders of giants. I am star-struck by a number of great thinkers in my field, the first being my supervisor. There is a man who lives his purpose; producing volumes of research articles; an enlightened plenary speaker at many, many conferences, and always taking the time to swiftly respond to my often panicky emails about methodology. Then I have to credit Derrida with confirming my suspicion that all of life is built on the principle of the absurd. My fractured identity has been honed and crafted by the postmodern gurus whose theories I wear like research skin. Do what is needed. Don’t worry about the outcome. Very often, I come down with a really bad case of imposter syndrome. I doubt my data, I think my research goals are crap, I agonize over the cost of a PhD and whether it’ll be worth it in the end. Or if there ever will be an end. Most of all, I think I’m going to fail my viva. 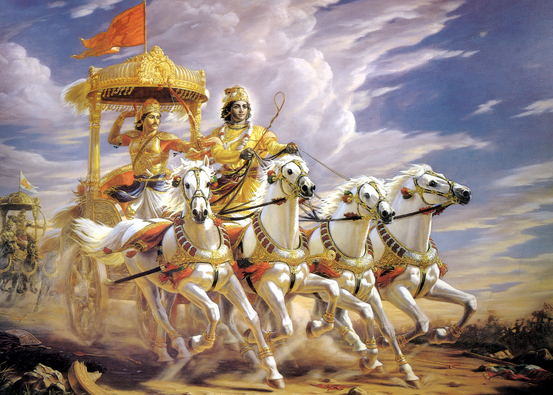 It’s then that I recall the primary lesson of the Bhagavad-Gita. If you think you’re going to fail, do it anyway. Put in 100 percent effort. Commit to the cause. Give your power to that which you can control. The outcome is not in your hands. You don’t need to see the whole picture. Just take the first step. The time had come for me to press pause on the voluminous reading for the literature review and write this chapter. Do I start with educational theories? Do I go with neo-liberal discourse first? Post-structuralism? They all needed to feature, but where do I begin? So I did. Reading-writing-typing-deleting is taking action. And action generates more action. I opened a book, cited a reference, typed a summary, deleted it, reworded it and did this daily. And then wondrously, paragraphs turned into pages. And pages into a thesis chapter. You will spend a great deal of time alone. PhD work is not like sweating in unison in a spinning class. It’s a solitary climb up your research Everest. Wear good boots. Nothing has taught me more about mindfulness than transcribing semi-structured interviews. I decided to transcribe verbatim each of the interviews for my research. The rigor of sitting, listening, typing hour-long interviews, doused with “err,” “ uhm”, cough, giggle, “you know” absorbed my head-space, and shut out neighbors slamming doors on my thirty-third floor apartment building. I used to think I had the most undisciplined mind. Sitting to read a book on narrative research, or something similarly thesis-related, my thoughts would jump to yoghurt. And navel oranges. Oh, and record Scandal! The call of real-life imposed on my well-intentioned academic moves to make progress with my study. Then it occurred to me. Perhaps the mysterious channels of how we grow our intelligence is simultaneously open to other secular ideas that float in student atmosphere. When you meditate the same secular thought invasions will inflict you. Maybe because you make the intention for your mind to be wide open. There doesn’t appear, to my mind anyway, a different mental gateway for thoughts about navel oranges from Egypt and thoughts about phenomenology. So now I sit and study with a yellow legal pad for list-making, plus my research diary plus a large A3 kitchen organizer! A PhD will not be rushed. I have devoted whole afternoons to carefully plotting my thesis work plan, complete with chapter submission due dates, making appointments for interviews, making appointments for follow ups, revising chapters and all that goes with it. I first did this 18 months ago. I did it again 5 months ago. That’s because I didn’t manage to get the submissions, interviews, revisions done as intended in the first plan. That’s because a lot of it depended on the availability of other people. And work commitments. And ordering books that take 2 weeks to get delivered and that’s not on the plan. So the second thesis work plan is supposed to be an improvement of the first plan, but I visited a psychic medium a few months ago and according to him my plan will be delayed into 2017. So now I rest in the refuge that I am only guided by my work plan, doing what is needed in the moment, like reading Foucault Studies or, Thesis Whisperer, while noting on my kitchen planner that mashed potatoes is the perfect comfort food to carb up for another mile on the research climb. Thanks Shifa! What about you? Do you have a spiritual or religious practice that helps you cope with PhD stress? We don’t talk much about religion in academia, but what lessons can we learn? Maybe just maybe I did not “experience” the Be in the Moment. Witty, whimsical and insightful! A great piece of writing. My PhD was on medieval mystical spirituality – I learned how to deal with the inevitable Dark Night of the Soul which arises at some point in the research process from my long dead medieval mentors. I for one totally or should i say temporarily lost half my journey of my phd. Its indeed a setback so i hear from those who have travelled and are still travelling this journey. To answer your question, yes i do and thats the only thing that keeps me going even though i lost everything when my car was broken into a month ago. Yes everything am back to square one literature search,re-organising ,replanning,summaries etc. Great post. That is what I love about this blog site, often I read someones blog that resonates with my experience in some way. It gives me courage to move forward. Yes, I draw everyday on my faith to guide me on the uncertainty of this PhD journey, it keeps life in perspective for me. First to thanks, thesiswhisperer.com/ for this too useful and informative post. Really this whole post is extremely unique and I like and enjoy it so much. Both the points mentioned in this post are too good especially “humanity” and “Patience”. So thanks again for this fabulous post and keep it. Just reading this post felt calming and meditative among a sea of stressors. One of the best I’ve read.